On the first full day of his life, I held a swaddled Ryan and rocked him for three-plus hours while I watched a college football game. Not just any college football game. A Michigan game. The school I was already dreaming of seeing Ryan attend. Maybe, just maybe, I dreamed of him wearing the famed winged helmet one day and taking the field at Michigan Stadium in front of 100,000-plus people. I was certainly dreaming of taking him to his first game, teaching him about the sport, and teaching him the words to the school’s fight song, The Victors. We would definitely watch games together, celebrating the wins, anguishing over the losses — like the stomach-punching one they suffered on his first full day in this world — and bonding over this shared love. I was already wondering about the appropriate age to take him to his first game. Five? Six? Veronica probably laughed at the absurdity of it, but to her there was nothing strange about me needing to see the Wolverines play the day after my son was born, and whispering to him all about the team. She was used to my obsession and being a huge sports fan of her own, completely understanding of it. I think she was just happy I managed to get through the game without waking him or dropping him after yet another drive-crushing Michigan interception. For me, there was no doubt. 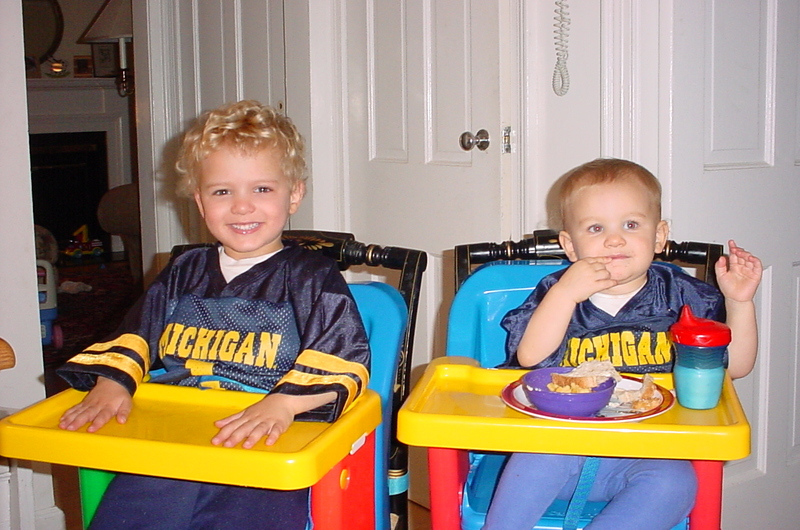 My children would grow up Michigan fans. Watching games together would be a ritual in our household. Attending games in Ann Arbor would be an annual excursion. It was just a matter of when. Autism would present a challenge to those dreams. Ryan showed no interest in football and sitting and paying attention to anything for three hours was always going to be an issue for him. His fifth, sixth, seventh, eighth years passed without us making the pilgrimage to Ann Arbor. In the interim, he began to develop the serious interest in hockey that is documented throughout this blog. Leading up to his ninth birthday, we were trying to figure out what to do for a party. He had outgrown the age where kids typically invite everyone in their class to a party at some venue, and in truth he did not have a lot of true friends. It wasn’t that he was disliked, but rather just unable to develop those kinds of connections due to his social deficits. We were encouraging him to pick out a special activity that he wanted to do. Because of his burgeoning interest in hockey, he said he wanted to have a hockey party. I figured that would mean taking the family and a few others to see our local team play. But when I offered to do that, Ryan had other ideas. “I want to see a Western Conference game,” he told me, having become a fan — entirely of his own choosing — of the San Jose Sharks. “Fine, when the Sharks come to town, we’ll get tickets and go,” I countered. Dollar signs were adding up in my head. We live in the Northeast. This was going to involve a flight — never the easiest thing with Ryan — and quite a few other expenses. But I was determined to come through for my boy since he had rarely expressed much interest in celebrating his birthday before. “Ryan, what is the closest Western Conference team to us?” I asked, as we had been working on using the NHL standings to learn geography. “Umm, Detroit?” came the correct answer. Detroit. Not so far. A quick flight. You know what else is near Detroit? Home to the University of Michigan. As Ryan’s is a fall birthday, I was already planning this out. We would figure out a way to see a game in Detroit and a Michigan football game — all in the same trip. There was a slight problem. Michigan usually has seven home games. Maybe four of them coincide with the NHL regular season. We’d have to find a Red Wings game on a Friday night (against a Western Conference team, of course) on a home football weekend. The task was about to get more complicated. Bigger problem. The Sharks visit the Red Wings exactly two times in a season that stretches from October to April. Whatever the odds were, they weren’t good. Now I’m not a religious person. I don’t believe much in higher powers. But I do think once in a while that things happen for a reason, whether it’s people that are brought into our lives or seeming coincidences that create incredible opportunities. I have no problem admitting I believe that what happened with the Detroit Red Wings and Michigan football home schedules that fall was no accident. As I raced to check the Wings schedule, I found it almost immediately. A Thursday night home game against San Jose, two days before a Michigan home game against Purdue. I called Veronica. And so it was that my children happened to have a four-day weekend EXACTLY coinciding with the four days I would need to take Ryan to Detroit, allow him to see a Western Conference vs. Western Conference NHL game, with one of those Western Conference teams being his new favorite, the San Jose Sharks, AND fulfill my life-long (at least the length of Ryan’s life) dream of taking my son to Michigan Stadium to see the Wolverines play. Who’s pulling the strings up there? Before Veronica could begin to list all the challenges we’d face, I had booked the entire trip. Flights, hotel, game tickets, rental car, and in Ann Arbor, a reservation to stay at my good friend’s house. This was going to be one memorable weekend. But, there were going to be challenges. Like most kids on the autism spectrum, Ryan craves routine. Sleep is challenging even with all the comforts and routines of home. We were going to be sleeping in two different locations, both completely unfamiliar, over three nights. He would be up late for the hockey game — further affecting his sleep. With lousy sleep typically comes difficult behavior. I’d have to find a way to get him his favorite foods and drinks since his eating was so restricted. I knew the hockey game would be no problem since he had developed such a love for the sport, but I’d have to coax him through a football game that can last up to four hours, navigating an enormous, crowded stadium and the need to arrive early after a lengthy walk from my friend’s house. Maybe I was biting off more than I could chew? I readied myself for the challenge. This was too big an opportunity to pass up, and if we lasted for a half of the football game, I’d consider it a win. Little did I know the victories I was about to witness. My jaw is on the floor. Can’t wait to read part 2. How on God’s green earth did you pull this off? (assuming you did, and that this has a victorious ending). I insisted on watching a Red Sox-Yankees end of the season game while in Labor and did my best to get the kid out in time to see the Sox win. Fail. He refused to budge and missed the game. It was a portent of things to come. 🙂 You give me hope that he may become a little Bill Jamesian stat-head one day. Can’t wait to read about Ryan’s first Michigan game. Oh crap, I hate “To Be Continued” posts, TV shows, just about anything….I am the immediate gratification gal. And no I am NOT 12…..but can sure act it, lol! Looking forward to part 2….I cannot believe how everything lined up! yea yea, i saw the ‘Part 1’ when I started reading. wasn’t expecting that kind of cliffhanger, though. haha. See you tomorrow, then. Sorry for the cliffhanger everyone but this is going to take a few thousand more words to get through. Hopefully you’ll find it was worth the wait. Part 2 coming Monday. Wait?! MONDAY????!!! did you know that the weekend has been postponed until after part 2 is done? I’m so happy I stumbled on your blog but now I’m dying to hear what happened! Thanks for the cliffhanger. One of my favorite things is taking in a game – more the volleyball and basketball variety and my twins are too young to go or really care (they are 4) but I wonder, like you did, if this will be something we share in together. We will see but I can’t wait to hear how yours is going. Good luck!